Built by English Electric at their Vulcan Foundry in Newton-Le-Willows, Class 50 represents the last mixed traffic diesel type to be built for British Rail and, at the end of its career was one of only three classes of diesel capable of 100mph duties. 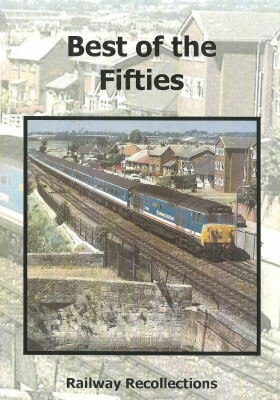 The Railscene programme was started in 1984, three years before the first ‘Hoover’ was withdrawn (it only required an F exam!). Four and a half years later less than ten of the original fifty fifties remained in use. 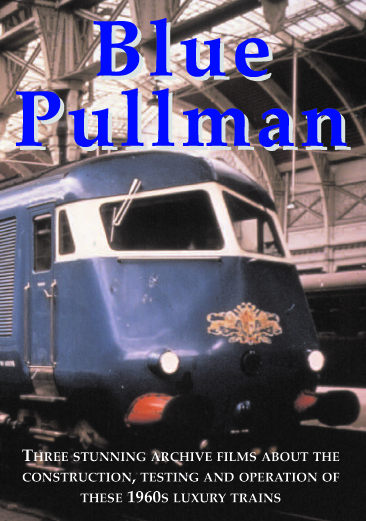 This dvd includes thirty-two of the class in action, it is compiled from the Railscene archives and is a tribute to probably the last of the ‘great’ express diesel class. Opener – A classic view the ‘Dutch fifty’, ‘Valient’ and plain blue ‘Thunderer’, as they cross the River Tamar on the Saltash bridge with Pathfinder Railtours ‘Cornish Centurian’. Part One – Fifty Miscellany – Variety is the spice of life. 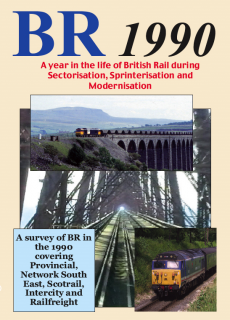 We start with railtours: ‘Courageous’ and ‘Victorious’ on the WCML. The ‘Fellsman II’ at Long Meg, ‘Sir Edward Elgar’ on Windsor Gala Day and an unscheduled duty for ‘Archilles’ banking ‘Drysllywn Castle’ and ‘Hagley Hall’ up Dainton Bank complete these mid-80s views. 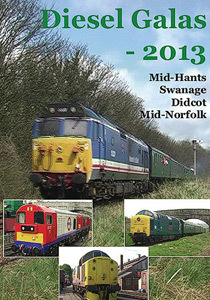 The former DCWA celebrities are seen at Penzance (Dutch ‘Valient’ again) and double-heading at Truro and Ocean sidings. More double-heading follows with ‘Ark Royal’ and ‘Furious’ at Par on the last official loco-hauled train from Newquay. ‘St. Vincent’, ‘Furious’, ‘Glorious’ and ‘Howe’ are seen on passenger duties at Lostwithiel, Ledbury, Aldermaston and Old Oak Common, whilst crash victim ‘Invincible’ and the first to go, ‘Centurian’ are seen looking sad. ‘Exeter’ works a passenger turn near Stoke-on-Trent in 1988 and ‘Archilles’ a freight from Parkandillack. The unique 50149 ‘Defiance’ is seen on ‘the Heathfield’ at Cutmadoc in addition to views on a Meldon quarry trip working. Another celebrity, ‘Ramillies’, heads the HST ‘generator set’ at Severn Tunnel Junction in 1989 and ‘Victorious’ provides rare footage at Winfrith and Wool with the track recording train. Large logo celebrity ‘Hood’ works ECS near Romsey and ‘Lion’ is diverted via the Southampton mainline: ‘Superb’ and ‘Temeraire’ are seen in action at Southampton and Portsmouth. Finally ‘Dauntless’ climbs the Portsmouth Direct Line at Rowlands Castle in 1989. Part Two – Waterloo to Exeter (‘The Last Stand’). ‘Fearless’, D400, ‘Ajax’, ‘Lion’, ‘Renown’, ‘Resolution’, ‘Glorious’, ‘Tiger’, ‘Vanguard’, ‘Defiance’, ‘Dauntless’, ‘Eagle’, ‘Repulse’, ‘Exeter’, ‘Illustrious’, ‘Thunderer’, ‘Victorious’, ‘Royal Oak’, ‘Sir Edward Elgar’, ‘Leviathan’, ‘Swiftsure’, ‘Dreadnought’ and ‘Temeraire’ in action on Table 125 duties. We start at Waterloo with 50050 on the very last newspaper train and the same loco as D400, arriving on its inaugural run. The Salisbury sequence (046, 043, a failed 007 and substitute 033), Wilton, Barford Street, Martin, Dinton, Tisbury, Gillingham, (‘Renown’ in freezing fog and ‘Dauntless’ doubleheading wih 47707), Buckhorn Weston, Templecombe, Milborne Port, Sherborne, Yeovil Junction – in 1986, Crewkerne, Chard Junction, Seaton Junction, (a diverted Paddington-Penzance train in 1985, ‘Ajax’ at the Summit, Honiton (HST and ‘Repulse’ pass), Whimple (1985), Exmouth Junction, Exeter Central and Exeter St. Davids. Cover Photo: 50049 Defiance approaches Redbridge with the 11.25 Paignton to Waterloo service on 25 June 1989.